The interviewer is spot on re "A girl who harbors all the qualities of beauty." She's so kind and such good hearted and humble!!! 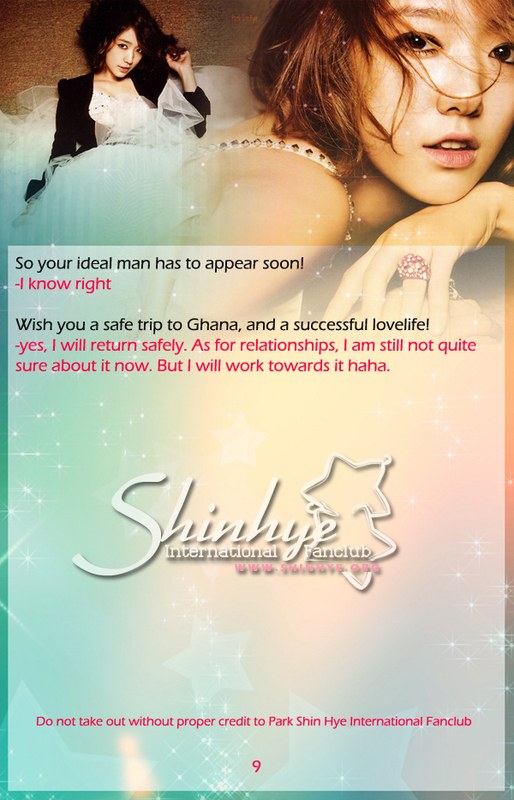 Wish Shin Hye good luck on her trip to Ghana. Love this girl! awww i'm glad our shinhye enjoyed filming heartstrings so much. i'm glad she wasn't to bothered with the ratings. she's so positive! love this interview. love Shin Hye! Park shin Hye is the epitome of smart beauty, her answers to each question is a testament of her depth, beauty is only skin deep and superficial, but this lady doesn't only have that but substance as well. Wow! I'm impressed! Discovering these new insights about Shinhye is delightful though i wish there was more. It's sad to know that she's incognito in Korea until Heartstrings. How could they when she was already 10yrs in that business? I wanna hug Shinhye warmly and tell her "you're doing very good and continue to be the best". I believe that God will crown her efforts with success in the future. On the good side, she was able to do things that popular one's can't do like riding public transport..roaming around freely..such simplicity. It's a relief to know that Heartstrings ended without major major conflicts. Shinhye had grown into a matured and responsible actress. I will pray hard that God will send a wonderful film project on her way. I feel like Shinhye has a lot of areas to explore in movie department. Shinhye ssi...stay beautiful and keep focus on your goal. Always remember that you are much love ^-^ Spread the love to Ghana. i agree with EoN "the interview is very refreshing"! a very smart writer for sure! not because she said really nice things about Shin Hye but because she was very candid and her questions gave you a different perspective, a different angle on Shin Hye. need to know this writer's name! thanks for translation. She mentioned a movie...so Im excited for that. Nice read! :) I do agree the questions are quite interesting in this piece :) Thanks for sharing! I am, too, surprised she was recognized more only recently. because I reckon she would be so recognizable after the popularity of YB. And, smart Shin Hye was right in saying because of the amount of technology being used now. I wish her "ideal" guy matched YongHwas traits LOLOL I wud've been hopping all over the place by now anyway AWESOME interview!! !